We’d love your help. Let us know what’s wrong with this preview of Under the Sicilian Sky by Alexia Adams. Matteo Vanni washed up on a Tunisian beach six years ago with no clothes, identity documents, or memories, just a wedding ring to link him to his past. He’s reinvented himself as a wealthy entrepreneur, but now a knock on the head restores some of his memories, particularly that Amnesia obliterates a married couple’s shared past in this poignant second-chance-at-love story. To ask other readers questions about Under the Sicilian Sky, please sign up. I enjoyed this story. Adams did a good job of creating a unique story out of the familiar trope of amnesia. It was fun watching Matteo and Bella rediscover one another and at the same time deal with Farrah, Kai, and Cristo. I also appreciated that, in spite of all these other suitors, the story stayed focused on Matteo and Bella--she didn't try to give Farrah, Kai, and Cristo love interests and happy endings (though maybe we'll see some of them in future books?). Also, the accident that triggere I enjoyed this story. Adams did a good job of creating a unique story out of the familiar trope of amnesia. It was fun watching Matteo and Bella rediscover one another and at the same time deal with Farrah, Kai, and Cristo. I also appreciated that, in spite of all these other suitors, the story stayed focused on Matteo and Bella--she didn't try to give Farrah, Kai, and Cristo love interests and happy endings (though maybe we'll see some of them in future books?). Also, the accident that triggered Matteo's amnesia was a huge factor in the story and yet Adams gave it a back seat to the relationship. I liked that it was an issue and affected them but Adams didn't use it to turn her romance into a suspense novel. Rather, it is definitely a romance novel, with just a hint of mystery. Adams also did a good job of showing growth in both Bella and Matteo as they struggled with their past, their future, and their new lives. For what will most likely be my final read of 2017, this book ended my year on a high note! I love when I go into a book thinking it’s going to be one thing, but get a surprise by it being something different. I was expecting Under the Sicilian Sky to be a heartwarming, second-chance love story. What I got instead: humor, mystery, suspense, action, a little bit of angst (just the right amount). This is a story I sat down to read after dinner and finished before going to bed. Bella was young when s For what will most likely be my final read of 2017, this book ended my year on a high note! Bella was young when she met Matteo Vanni. They fell for each other fast and hard, and married quickly. They were incredibly happy. But six years ago, Matteo vanished without a trace. Once her father-in-law died, Bella took over the Vanni family farm and has done well for herself. She’s done a lot of growing up. When Matteo shows up on her doorstep one night, their reunion doesn’t go the way either of them ever envisioned it. This reunion was the first surprise in this story. Despite appearing to be a decent guy when we first meet him, Matteo behaves like a jerk. And Bella reacts accordingly - instead of falling at his feet, happy for his return, she pushes back and isn’t so quick to reunite with him. She even makes him stay in the guest house. And throughout the book, Bella remains a strong, independent heroine. Instead of being led by her hormones (which is the second big surprise) because Matteo is still so good looking and their chemistry is still there, she knows they probably aren’t the same people who married eight years ago. Thankfully, Matteo doesn’t continue to behave like a jerk. Even though his memory hasn’t completely returned, and there’s still the big mystery about what happened to cause him to lose his memory, he goes about trying to win Bella back. They spend time living in each other’s current world trying to decide if they can go back to being husband and wife, or if they’ll have to walk away and continue living as they had been. It was an interesting situation Bella and Matteo found themselves in. Add in the mystery/suspense element surrounding Matteo’s disappearance, and this was a book I couldn’t put down. The plot moved quickly and held my interest page after page. I liked both Bella and Matteo. There were plenty of humorous situations, but also parts that were touching and heartfelt. It was the perfect blend of romance and suspense, and an excellent way to end my reading year! Another well written book by this Author!!! *Recv'd a copy in exchange for an honest review. 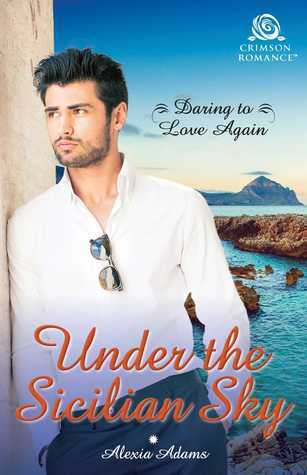 A contemporary romance set in an exotic backdrop, “Under the Sicilian Sky” is the first book in the Daring to Love Again series and takes on a marriage in complete disarray after Matteo’s six years of amnesia and separation. Mario/Matteo and Bella are the main characters of this love story. Mario had amnesia and was in Tunisia for the last 6 years until he was concussed once again in an accident and he remembered who he was. Once Mario went missing the New Yorker Bella, who left everything behind to follow and marry him, was left alone to care of his father and their farm in Sicily and she accomplished to make the farm profitable for once. Though she tried to move on with her life and she started dating, noone could Mario/Matteo and Bella are the main characters of this love story. Mario had amnesia and was in Tunisia for the last 6 years until he was concussed once again in an accident and he remembered who he was. Once Mario went missing the New Yorker Bella, who left everything behind to follow and marry him, was left alone to care of his father and their farm in Sicily and she accomplished to make the farm profitable for once. Though she tried to move on with her life and she started dating, noone could compare with Mario. When Mario returns home to claim her, Christoforo, Mario's best friend, as well as Kai, ex-fiancé of Bella, step up to declare their interest for her, too. Bella takes the matter at her hands and she decides to give one date to each one and afterwards she will announce with whom she will continue dating. Mario's date is the last one and while getting once again acquainted with each other he persuades her to give the two of them more time - a month. Spending two weeks in Sicily in Bella's way of living and two weeks in Tunisia in Mario's, while acting like a real married couple. This will remind them of their love and their deep feelings. The story had potential to be nice, easy to read story but I really found it difficult to read. It didn't have much depth and story was just missing a bit more details. It felt quite rushed and a bit too straight forward. When I read the blurb, I had thought it this book was a romantic suspense. Instead, by the 3rd chapter to about 80% of the book, the story turned into a reverse harem, cat and mouse romance story. Quite disappointing. Bella was widowed young and left in charge of the family farm. Life definitely hasn't turned out as planned. Matteo has lived the last 6 years not knowing who he is. Suffering amnesia has him constantly questioning his life. A quick knock to the head and suddenly the memories return leaving more questions in its wake. This story has a lot of potential but really fell flat for me. The characters were under developed and the story was choppy. By the end there were more questions than answers. With that said I do believe with some more work this could be an amazing story.